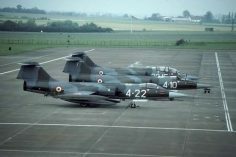 This period the Dutch Air Force 312 Squadron, based at Volkel flying the F-104G exchanged with the Hellenic Air Force 335 Mira flying the F-104G as well from Araxos AB. It was a two-way exchange. 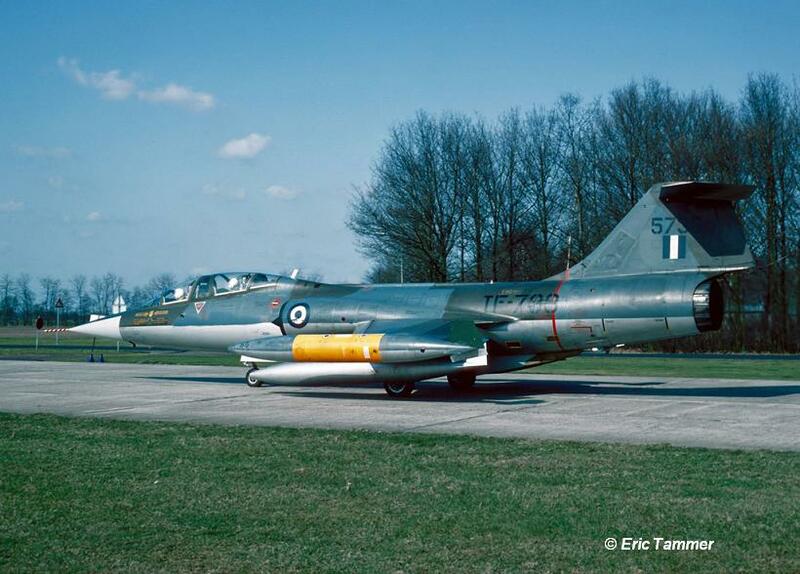 The Greek Starfighters which flew to Holland were TF-104G 5733/FG-733 and two F-104G aircraft 62-12314/FG-314 and 63-12734/FG-734. 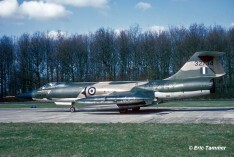 The two F-104Gs landed March 30th with callsign TKR733, while the TF-104G landed 1 day later. Actually the plan was to come to Volkel with four aircraft, but sadly one of the had to return with a malfunction when they arrived at Grosseto (fuelstop). 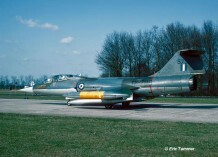 On February 21st till 23rd two Hellenic Starfighters (TF-104G 5733/FG-733 and F-104G aircraft 63-12713/FG-713 visited Volkel AB for the pre-exchange. Dutch Starfighters flew to and from Araxos AB via Rimini AB, Italy, being D-8048, D-8062, D-8063, D-8281 and TF-104G D-5804. They left Volkel AB on March 29th and arrived back at Volkel April 7th, while the Hellenic Starfighters left Volkel already on April 5th. Beneath some photos taken at Volkel Air Base by Eric Tammer on April 2nd. In total four Starfighters from Italian Air Force 21 Gruppo based at Cameri AB exchanged with 526 TFS/86 TFW at Ramstein flying the F-4E Phantom . 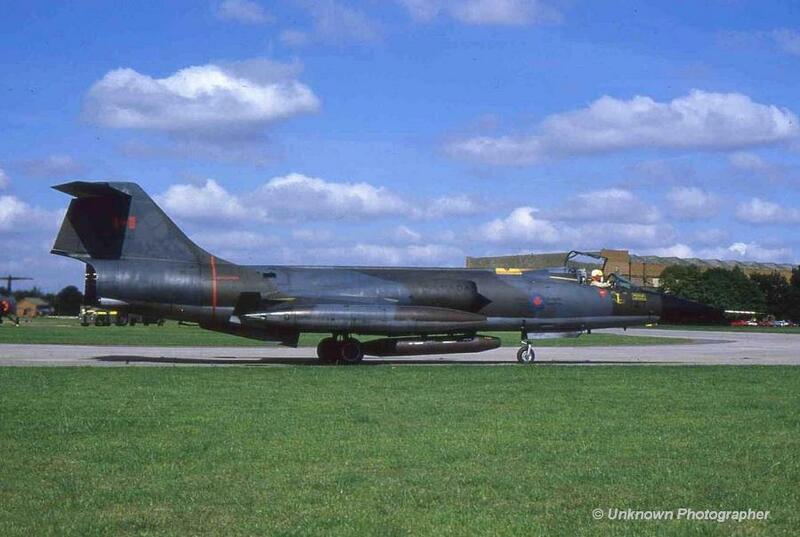 In total 4 Starfighters flew to Ramstein while also a number of Phantoms flew to Cameri. Participating aircraft were MM6810/53-03, MM6xxx/53-03, MM6xxx/53-15 and MM6xxx/53-16. Also a C-130 flew over being MM61992/46-06. This month the Belgium Air Force 350 Squadron (1 Wing), based at Beauvechain flying the F-16 exchanged with the Italian Air Force 23 Gruppo flying the F-104S from Rimini AB. It is unknown if it was a one or two-way exchange but at least four Italian Starfighters flew to Belgium. Participating aircraft were MM6719/5-32, MM6739/5-34, MM6778/5-36 and MM6820/5-35 with C-130H MM61992/46-06 which arrived at Beauvechain during the leave at 19 April 1984. This month the Italian Air Force 132 Gruppo, based at Villafranca and flying the F-104G exchanged with the Dutch Air Force 314 Squadron, based at Eindhoven AB, flying the NF-5. It was a 2 way exchange. Pre-visit at Eindhoven took place on 29 March 1984 by MM6609/3-03 and MM6633/3-26 together with an MB326E MM54386/"65". On 8 May 1984 the exchange started with the arrival of aircraft MM6505/3-05, MM6586/3-12, MM6563/3-16 and MM6527/3-21 in Holland. Two G-222 aircraft (MM62130/46-37 and MM62133/46-93) came over as well. 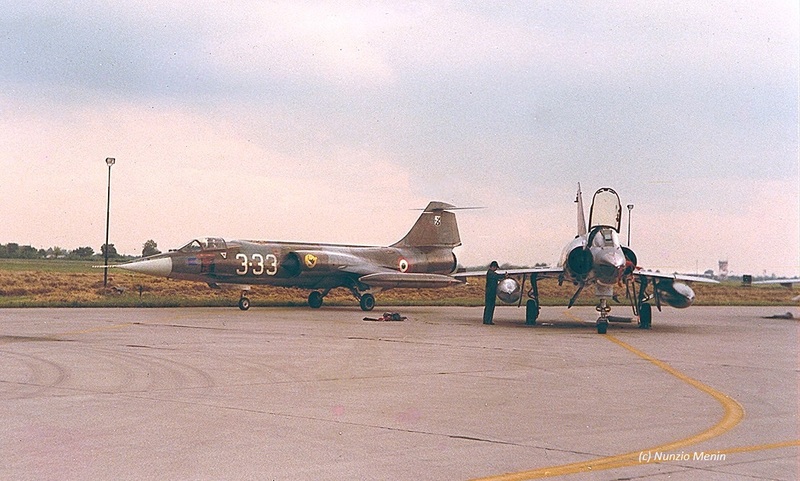 Starfighters from Italian Air Force 28 Gruppo based at Villafranca AB, flying the F-104G exchanged with EC 2/3 at Nancy AB flying the Mirage IIIE. It was a two way exchange. 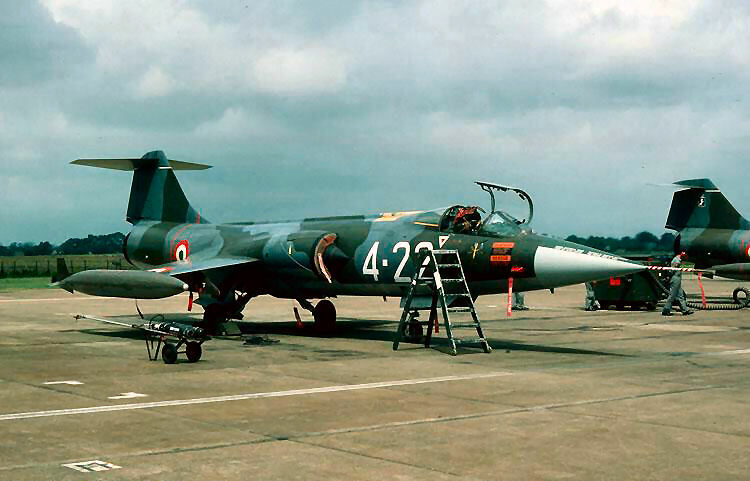 Four Italian Starfighters were seen at Nancy during this period. 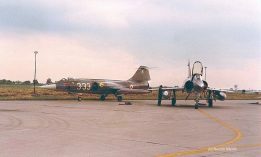 Photo beneath (thanks to Nunzio Menin) shows a Mirage III at Villafranca with F-104G MM6528 code 3-33 in the background. This year 1984 the Italian Air Force 10 Gruppo, based at Grazzanise and flying the F-104S exchanged with the Spanish Air Force ALA 11 flying the Mirage IIIEE from Manises-Valencia AB. It was a two-way exchange. 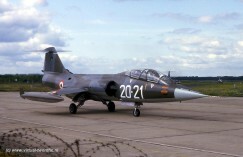 The Spanish took also a two-seater Mirage to Grazzanise for taking pilots on a familirisation flight. 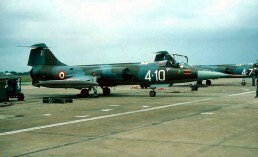 The Italians brought four one-seater F-104S aircraft to Valencia being MM6730/9-52, MM6817/9-45, MM6827/9-46 and MM6932/9-41. 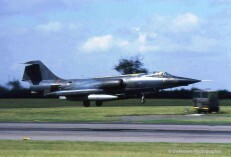 During the exchange both Mirages and Starfighters were engaged in Dissimilar Air Combat Tactics (DACT) although the roles of the two units are, under normal circumstances, somewhat different. It was decided that the Italians didn’t use the Sparrow systems because the Mirages did not have any chance being victims beyond visual range. So they decided to fight visible only. The exchange lasted 10 days and the magazine Aviation News of January/February 1985 spent a four page article on this exchange including a photo on the front cover. This year the Italian Air Force 102 Gruppo based at Rimini AB, flying the F-104S exchanged with the Canadian Air Force 441 Squadron based at Baden-Sollingen AB, flying the CF-104. it was a shifted squadron exchange. 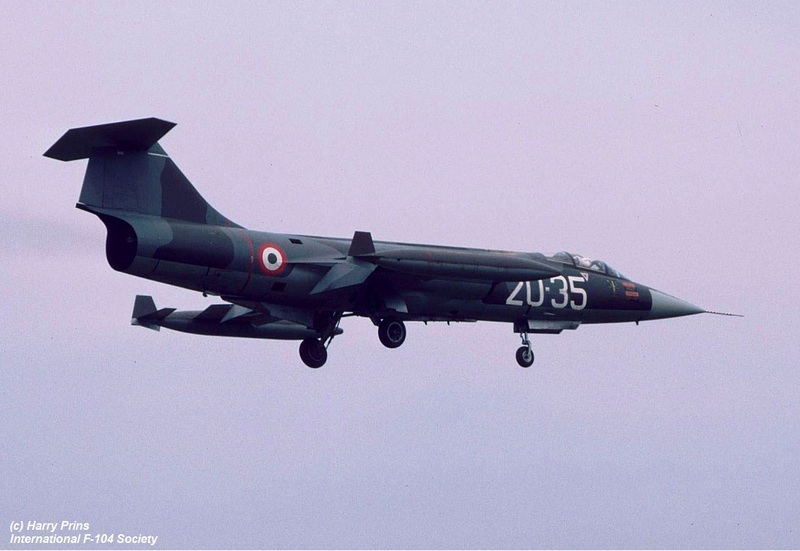 First eight CF-104s flew to Italy from 18 till 28 June and lateron, between 4 and 13 September four Italian aircraft flew from Sollingen. 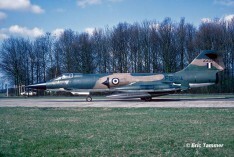 This month Italian Air Force 9 Gruppo based at Grosseto AB, flying the F-104S exchanged with Royal Air Force 56 Squadron at Wattisham AB. flying the Phantom FGR.2. On 12 June MM6722/4-10, MM6930/4-22 and TF-104G 54251/20-15 arrived as a pre-visit. On the 17th of July four Starfighters arrived : MM6722/4-10, MM6930/4-22, MM6732/4-2 and MM6778/4-7. The aircraft flew to and from Wattisham via Buchel AB using call-signs “I6722” (4-10 and 4-22) and “I6778” (4-2 and 4-7). The aircraft received 56 Squadron zapps while at Wattisham. Since the TF-104GM MM54255/20-20 was also noticed in August 1984 with 56sq markings it is very likely that this aircraft has visited Wattisham as well during the squadron exchange. Beneath a few photos taken on the Wattisham flightline during the exchange which was most probably 2-way. The first shows the three aircraft at Wattisham during the pre-visit. This period the German Navy MFG2 (2nd Staffel), based at Eggebek flying the F-104G exchanged with the Italian Air Force 12 Gruppo flying the F-104S from Gioia del Colle AB. It was a two-way exchange. Participating Italian aircraft were MM6710/36-02, MM6776/36-06, MM6807/36-11 and MM6814 with likely serial 36-12 but not confirmed yet. The Germans flew to Italy with one TF-104G and five F-104G aircraft. This month the Italian Air Force instructional squadron 20 Gruppo based at Grosseto flying the TF-104G and F-104G exchanged with the Dutch Air Force instructional 313 Squadron based at Twenthe AB flying the NF-5B and NF-5A. 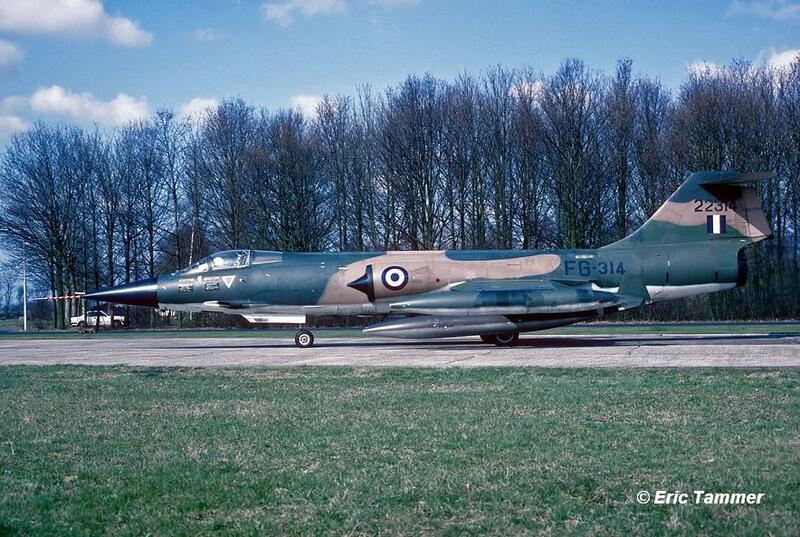 A number of Italian Starfighters flew to Holland. 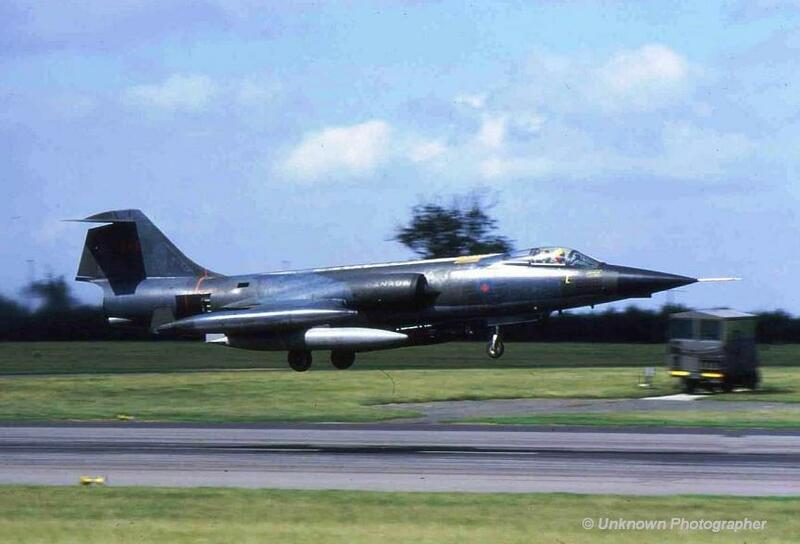 Pre-visit at Twenthe was paid by MM54233/20-9 and uncoded MM54237 on 5 July 1984. 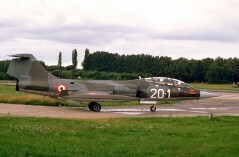 Participating aircraft at Twenthe were MM54226/20-1, MM54256/20-21, MM6522/20-31 and MM6561/20-35. Also a G-222 MM62135/46-94 came over with callsign "I2112". It was a shifted squadron exchange because 313 Squadron flew to Italy in September. Photo beneath shows MM54256 code 20-21 and MM54226 code 20-1 taxying at Twenthe AB and also MM6561 code 20-35 landing (photo Harry Prins). This month the Canadian Air Force 439 Squadron, based at Baden Sollingen flying the CF-104, exchanged with the Royal Air Force 29 Squadron based at Coningsby flying the Phantom FGR.2. 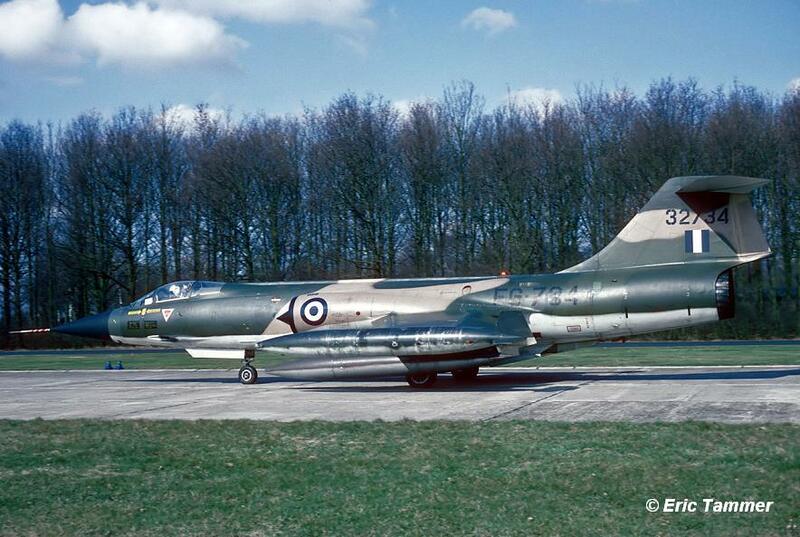 It was a shifted 2 way exchange where first eight Canadian Starfighters flew to the UK. Because Coningsby was receiving maintenance 29 Squadron was operating from Waddington in stead. Seen at Waddington on the 10th of August were CF-104s 104747, 104756 and 104893. Other aircraft was not identified but almost sure were 104638, 104750, 104776, 104790 and 104650 which all on their way back home on August 20th landed at Leck (Tiger meet party, stated inside squadron book). Beneath photos of 104747 taxying and 104893 landing at Waddington. The next month, on September 12th, four 29 Squadron Phantoms landed at Baden for their half of the exchange. This year the Canadian Air Force 421 Squadron, operating the CF-104 at Baden Sollingen, exchanged with the Spanish Air Force ALA14, based at Albacete, flying the Mirage F1CE. It was a two-way shifted squadron exchange. 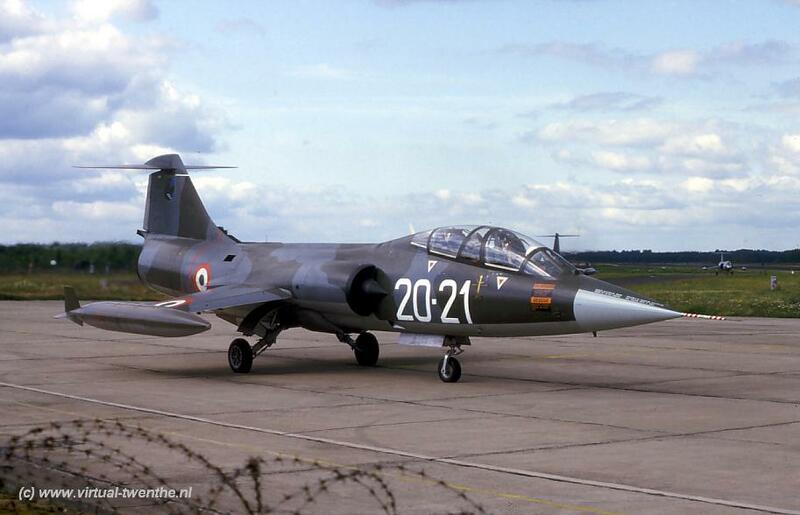 First the Starfighters flew to Spain and later during October the Mirage F1CE aicraft flew to Germany. This month the Canadian Air Force 441 Squadron based at Baden-Sollingen AB, flying the CF-104 flew to Tanagra for a 1-way exchange. 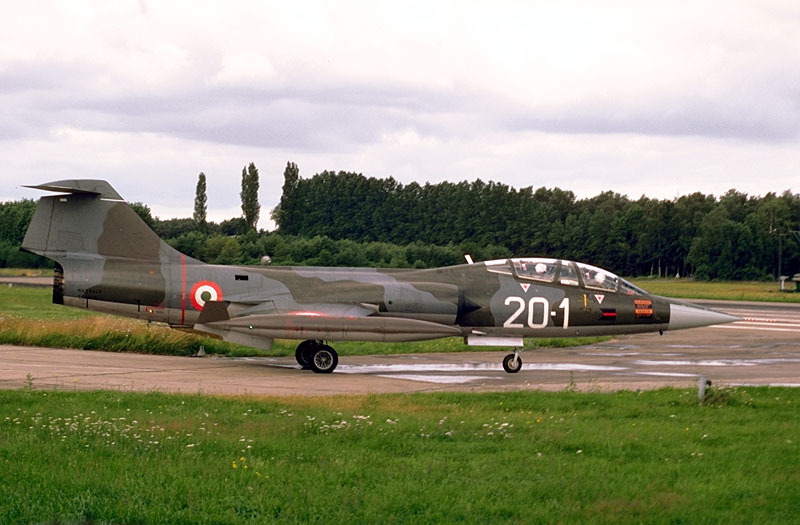 There they flew DACT missions against the Tanagra based Mirage F-1CG aircraft. 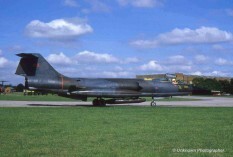 This year the German Air Force JBG33 based at Buchel, flying the F-104G exchanged with Danish Air Force Saab Drakens from one of the squadrons, based at Karup. It is unknown if this was a one or two way squadron exchange.